Recognizing the impracticality of the "Green Revolution" for many of the world's starving peoples, John Jeavons and his co-workers at Common Ground have spent the last 26 years doing pioneering research to improve the yield of home gardens. 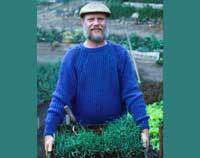 He calls his technique biointensive agriculture. His goal is to produce the maximum amount of food from a small plot using the minimum amount of energy inputs and water. The results have been spectacular and offer real hope for solving at least part of the world hunger problem. There are biointensive projects underway in many developing countries, including Mexico where gardens are having a noticeable impact on the health of villagers in Tula. "Jeavons is...probably 10 to 15 years ahead of his time, but his time is coming...My guess is that we're going to see a lot of public research spent on things John Jeavons has been doing by himself." Bob Bergland, former U.S. Secretary of Agriculture. "I strongly recommend CIRCLE OF PLENTY, not only because of the quality of the video and the subject content, but because it shows a workable solution to a major problem." "The excitement of an individual's improved self-sufficiency and its implications for the Third World are captured." "CIRCLE OF PLENTY reminds us of the need to think small and local in our research and development projects."